We’re closing out ’10 faces of Kaibosh’ with the incredible Matt Dagger! Matt became general manager in 2012. When Robyn and George Langlands stepped away from Kaibosh, they did so because they knew it was in brilliant hands. Matt is extremely humble, but Kaibosh simply would not be where it is today without him. Matt puts his heart and soul into his work, and the evidence of that is clear in how much Kaibosh has grown over the last 6 years. The ultimate multi-tasker, Matt lives and breathes Kaibosh and is always juggling a million things. An eternal optimist, Matt is encouraging and supportive, in both successes and challenges. Genuinely caring and compassionate, he has the biggest heart for people, not only for those Kaibosh is supporting, but also for the wider Kaibosh family. Matt has contributed a wealth of social links and community connections to Kaibosh over the years, these connections have helped Kaibosh grow and deepen it’s professional and heartfelt approach to the work we do. There are few people in Wellington’s community sector that Matt doesn’t know! We all feel incredibly blessed to be a part of Matt’s team and to have him leading Kaibosh into the next 10 years! 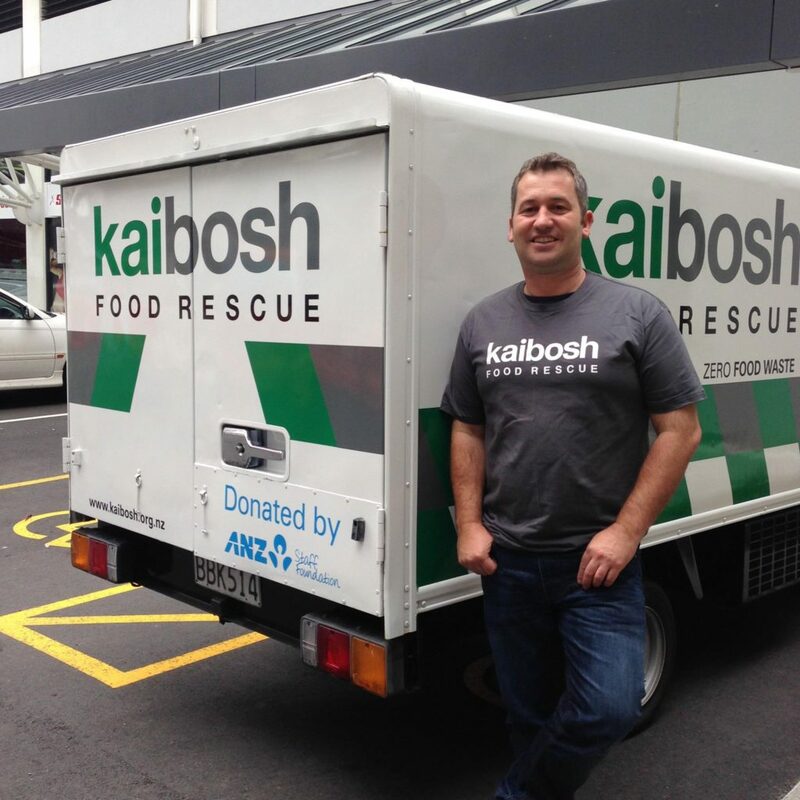 I first became aware of Kaibosh almost ten years ago when I was working for the Wellington City Mission. The Mission runs a number of services and fresh sandwiches and meals from Wishbone started appearing in the drop-in center, then later a regular supply of fresh fruit and veges from the weekend markets was reaching us each Monday. We watched as Kaibosh slowly grew under Robyn and George Langland’s guidance and when the opportunity came up to work for Kaibosh, I jumped at it. There have been so many – both good and not-so-good! Winning the Trust Power Community Award in 2012 and then the two SBN awards in 2015 were amazing. Getting the full-scale backing of Countdown and their amazing support of food rescue around New Zealand has been tremendous. Opening our Hutt branch in 2015 and watching that grow and flourish has been really special. We’ve had some amazing events over the years too – Garage Project’s annual 12 Kegs fundraiser, Spring for Kaibosh gigs, four very different but equally delicious All Taste No Waste events and having the students of WelTec now running this, the growth of Make a Meal in May… so many fun times! For me though, being able to meet so many people and to work for an organisation that receives so much goodwill from everybody in our community has been something that I could never have imagined. I consider myself very, very fortunate to work in a place which has so many people with so much generosity backing and supporting us. Kaibosh is carried along by the most incredible network of funders, volunteers, food donors, recipient charities, trustees, staff and a myriad of other supporters. Trust me, a stint working at Kaibosh does great things to restore one’s faith in humanity! It hasn’t always been fun though. The November 2016 quake set off a pretty tough time for our crew after we had to leave Tennyson Street and were shunted across a few different locations. Things felt pretty shaky at times there (pun fully intended!). We received a huge financial boost to help us through from Countdown and people rallied around to keep the food rescue programme running in the city – amazing generosity again! We have really come through the other side stronger and it all feels like a very long time ago now. Being a part of the growing community at the Hopper Hub is something wonderful that I never could have foreseen back in those shaky times. This is a photo that was taken back in 2014 when we got our second truck donated by the ANZ Staff Foundation – what fine folk! Great Kaibosh supporter, local MP and now Minister of Finance, Grant Robertson had just cut the ribbon for us and we were sending it into action. This was a really valuable thing for Kaibosh as it instantly doubled our pick up capacity and enabled us to start working up in the Hutt, from where the second base eventually grew. That was a good day! Help Kaibosh celebrate 10 years! Donate $10 a week and provide the equivalent of 10 meals each week to people in need.